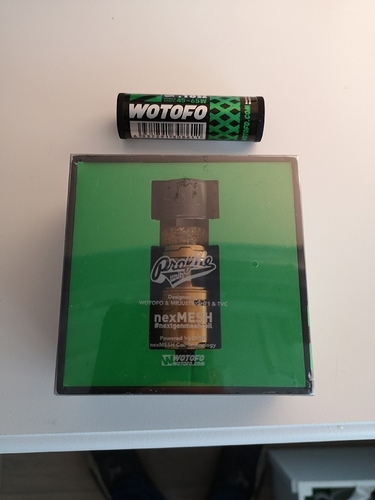 Because I love all things WOTOFO…here’s my unbiased review. Profile Unity RTA is designed by Wotofo, Mrjustright1 and The Vapor Chronicles. It is the unity of vape insights from different perspectives creating a tank that is not just a one trick pony. 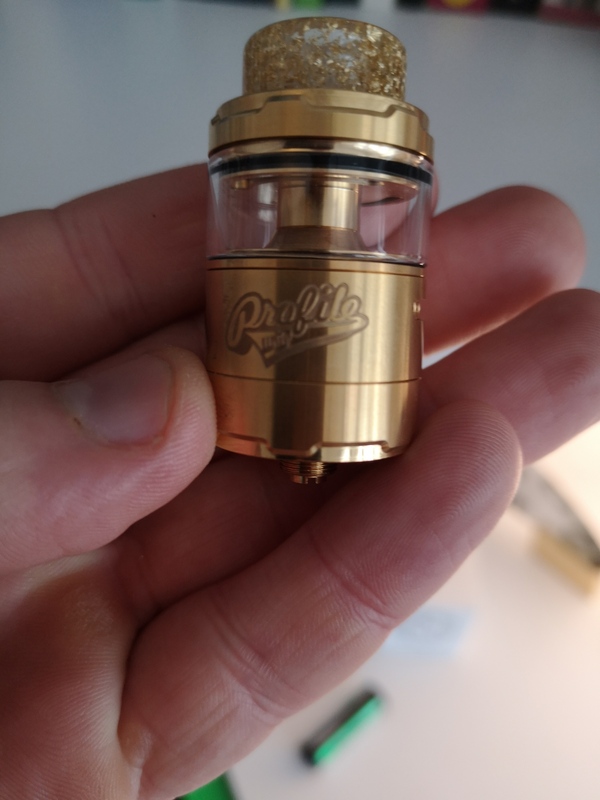 This is pretty exciting stuff to be honest as in recent months we have seen tanks pigeonholed as either Flavour monsters or cloud chuckers, or just straight out handsome looking fellas. This is the first time that I have come across a tank that is all three. We are talking Wotofo here, so of course flavor is gonna be off the charts, but cloudability is not sacrificed in any way. This is my first foray into mesh’dom so treat me as a total mesh novice. The tank is fired by nexMESH OFRF, the triple density mesh coil. You get a couple thown in with the ever growing extras that the Wotofo Fam add to the box. In simple terms you need to mould the mesh around the supplied ‘mesh shaping tool’ (I don’t think there is a word yet in the dictionary for a mesh shaping tool). Now this is the point I was reminded I was a novice. I tried to shape it around the thin ‘wrong’ end of the tool. With a flashback to misspent teen years watching rather blue VHS’s whilst the olds were at book club….just remember ‘use the fat end…use the fat end’! 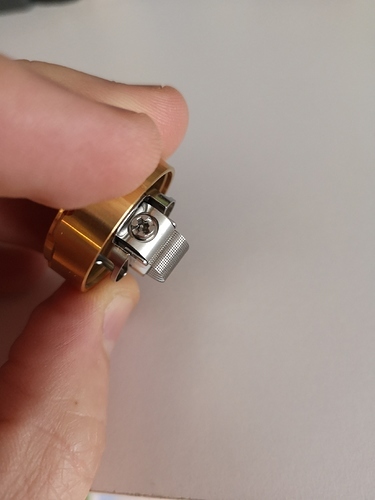 With the mesh correctly shaped, you simply unscrew the coil clamps and insert the legs in and tighten up. About as painfree as coil installation could be. This was the easy bit, maybe it lulled me into a false sense of security about the wicking embarrassment I was about to endure. 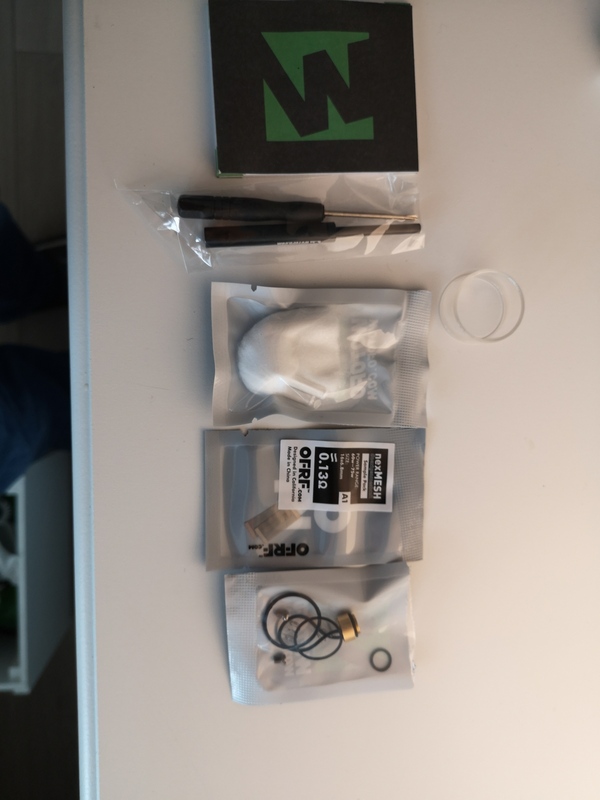 NOW THIS IS THE BIT TO PAY ATTENTION TO unless you have a eliquid factory next your house that gives it out free, and you have a cotton farm in the garden. 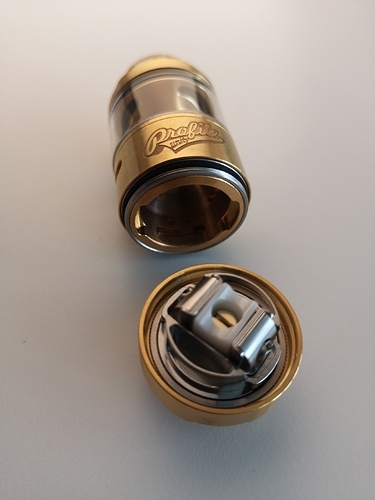 Being a new release, there isn’t a huge amount of info on the net or tutorials for wicking. I gave the comprehensive instruction manual less than a momentary glance, and tried to read the German version to see if miraculously I had learnt German overnight by putting a German book under my pillow….another old wives tale that didn’t work. We are getting to the CRUCIAL part. 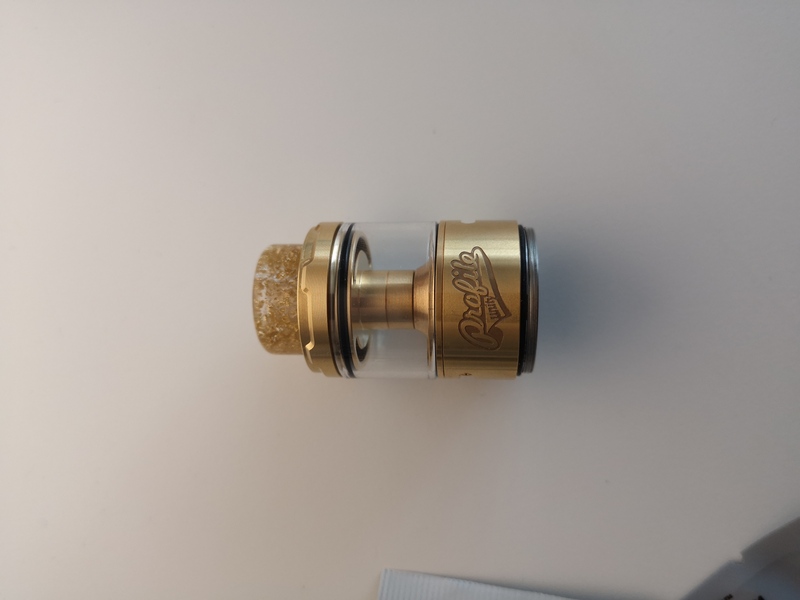 You need to use the 6mm supplied agleted cotton made by wotofo. I never like to be forced to use branded product specifically for one purpose, but having wasted half a pack of cotton bacon and half a pack of Kendo in 3 days trying to stop this baby flooding my house, I succumbed to the sensible choice. This brings me to the question of why the word UNITY was used…because having splattered the house in liquid custard (no the olds were neither out nor in, and no, the VHS was off) there was absolutely no UNITY at all between my angry wife and I. Potentially I could have renamed it ‘Divorce Profile’, ‘Angry PROFILE’, ‘All your juice smells like Vanilla PROFILE’, ‘NO I don’t want to smell your new Juice, it all smells the same PROFILE’…you get the POINT. To be very clear here, this was MY FAULT, it had nothing to do with this beautiful new tank. USER ERROR totally to blame for it. This tank has 2 sets of Juice holes, one set exactly parallel with the gap in the well where the cotton legs dip their fluffy toes in the honeycomb custard #Chefs Flavours. 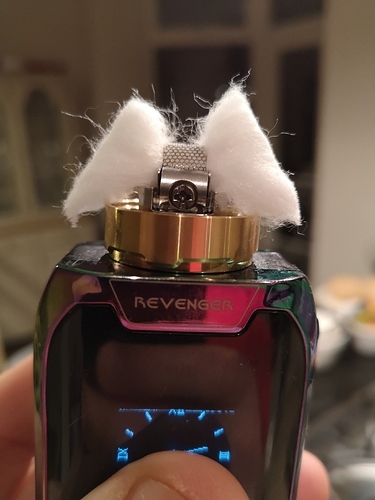 One set higher up on the inner domed cap to allow juice to feed the shoulders of the cotton. It is these holes that I didn’t know about, and are what caused me leakage. 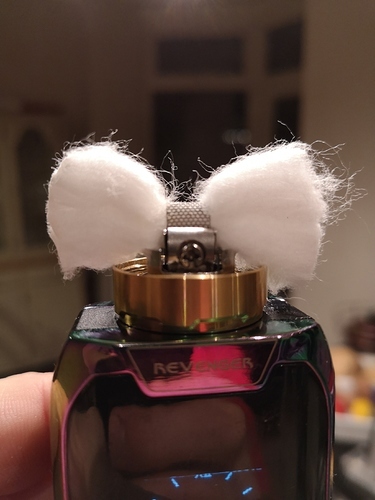 You 100% have to wick your coil so that the cotton almost looks like the Mcdonalds ‘M’. 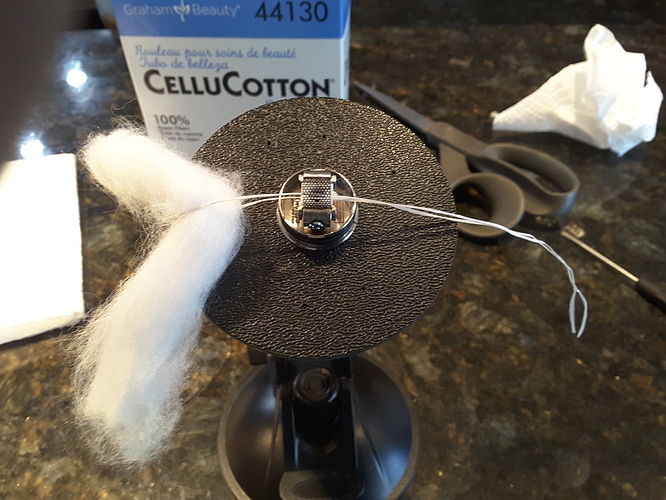 The shoulders of the cotton whick need to be about 3mm higher than the coil surface to guarantee you are plugging these juice holes. Also, you need to unscrew your base from your mod, once wicked, in order to screw it back onto the top tank. It is important to align it well so that you don’t compact, move or misshape your mcdonalds ‘M’. This all sounds a bit fiddly, but once you have got it right, you wont get it wrong. The base also has a springloaded peek insulator. This is pretty clever, in that it pushes your cotton up against the Mesh. 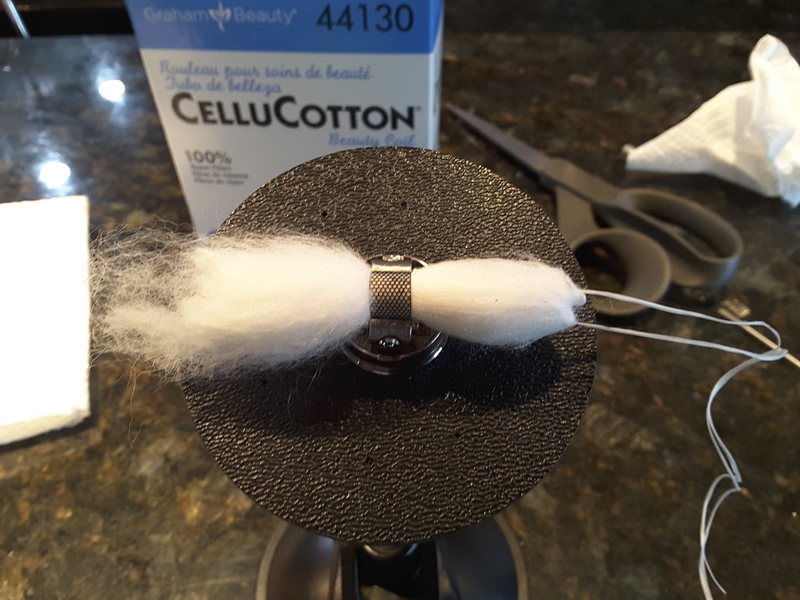 If you don’t use enough cotton you will get dry hits from the gap between cotton and mesh. 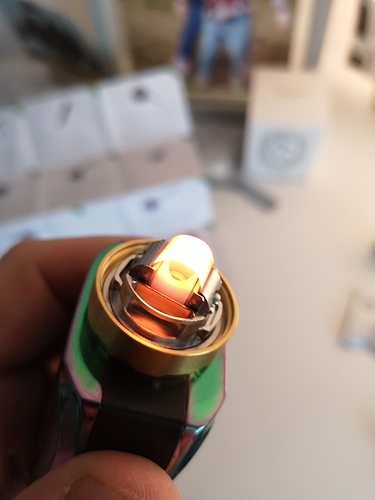 I struggled to vape this over 40 Watts at first, because of this very issue. I contacted Wotofo, and they ran me through step by step wicking to achieve the best result. I would say this is a differentiator… the wotofo guys, they actually take the time to help their customers. I even made a rather terrible video of my wicking attempt to show them what I was doing. Fair to say that I will not be entering into the world of youtube. I looked angry and incompetent on film, and totally devoid of personality. So, now that I have done all the hard work, made all the mistakes, what does this mesh novice think of the unity? I really really like it. Great flavour, decent clouds and it looks mighty fine. I love the drip tip, I like the honeycomb airflow, I hate the filling mechanism. My only real negative is the size of gap you have to fill it. 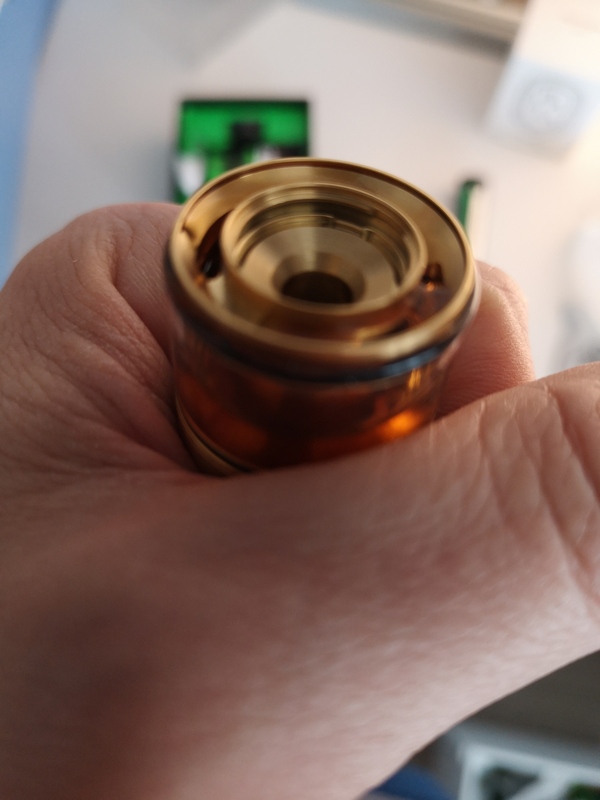 The topcap comes off with a nifty quarter turn click, to reveal a 2mm gap for your juice to enter. They say mice can get through holes 10 times smaller than their body size….I felt a little bit like Richard Gere holding a mouse in one hand, and a lit match the other end of the tank. I admit, the mouse didn’t get through the gap, but mouse fur is a fantastic wicking material, with ready made shoulders…who knew? Buy the Wotofo 6mm cotton. It comes in 10 piece packs for a few $. 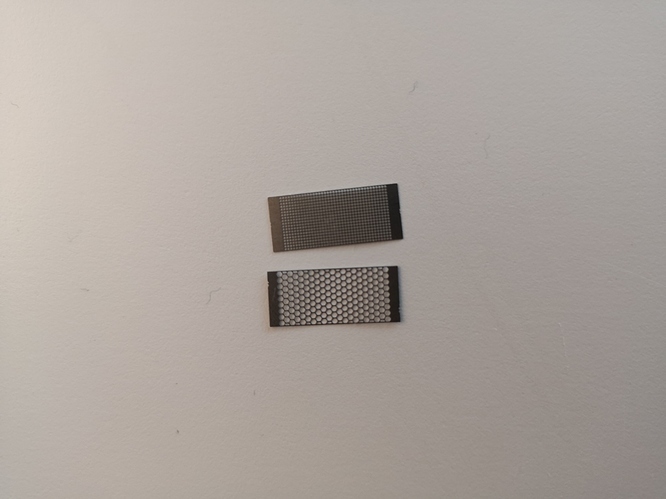 It was made for the profile and is the right shape to easily block up all those high and low juice holes. Persevere with wicking. More up top above the coil (shoulders of the Mcdonalds M, less down below in the Juice well. 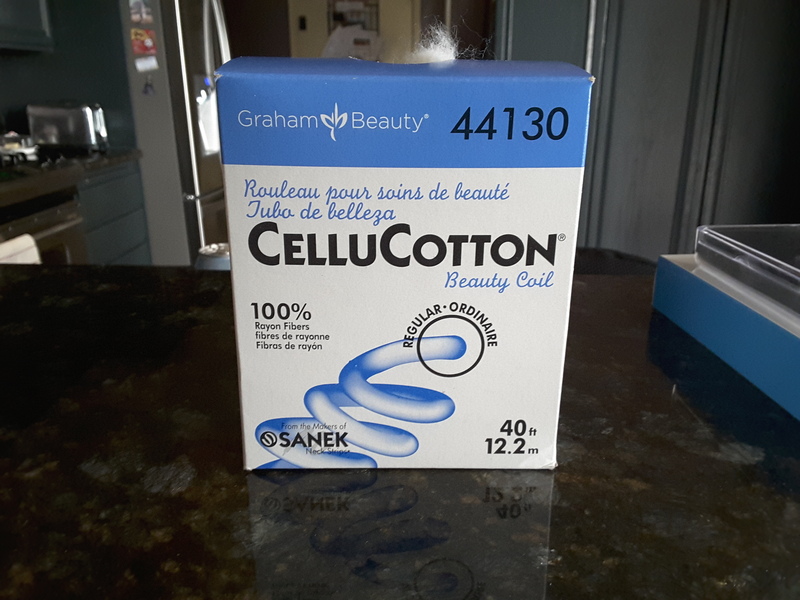 Thin those sides out so the cotton does not protrude. Like you I love Wotofo products, so will no doubt have to look at adding this to my next shopping cart. Well done … bravo ty for your review and opinion . 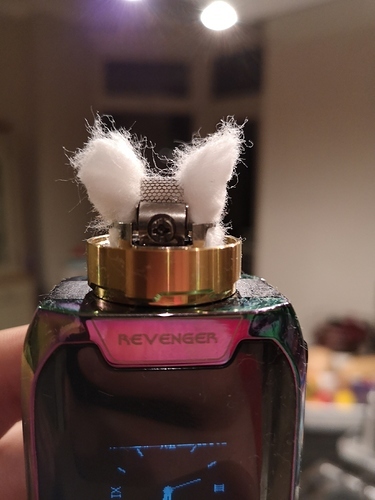 So you steam clean sub ohm coils? 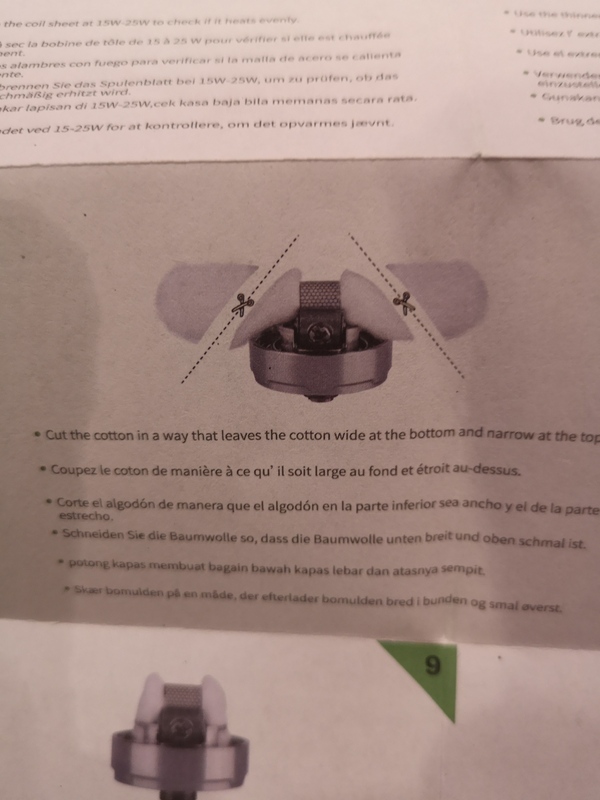 Does that clear the cotton too?